What is Sprock n' Roll? Sprock n’ Roll is Memphis’ BEST party bike. 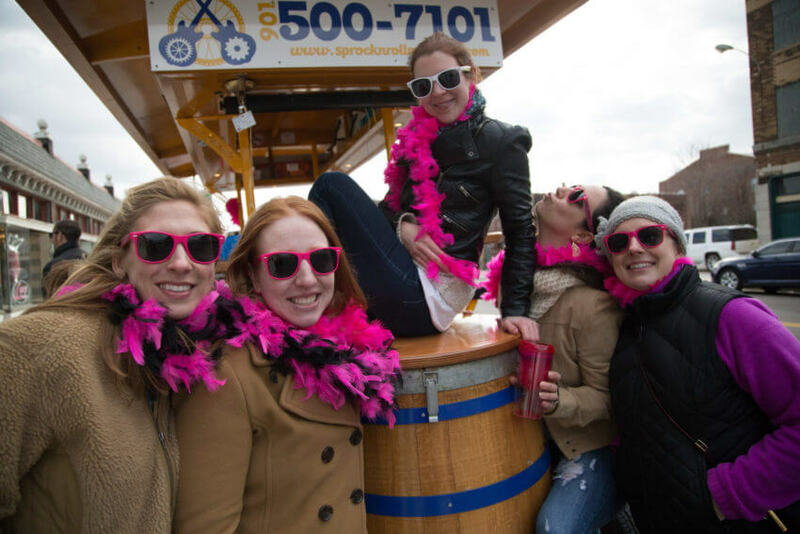 Round up a group of fun friends, and come check out our 2 hour long pedaling pub crawl tours. Bikes can fit up to 16 people. Got more than 16 people? 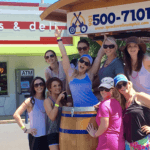 We have five bikes to accommodate your large group. Don’t have 16 people? Check out our Mix n’ Mingle tours to team up with other groups to fulfill our 6 person minimum. There are 12 bike seats (6 on each side) and a bench in the back seating 3, and a spot in the middle with the guide. Yes, BYOB (bring your own beer/beverages). We have tap service on the bikes for pony kegs. 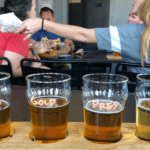 Sprock n’ Roll will provide cups for all alcoholic beverages per City of Memphis rules. NO GLASS PERMITTED is permitted so please transfer anything that comes in glass to plastic prior to arrival. Aluminum cans and boxed wine are great! Please bring your beverages, ice, snacks and water. Memphis’ heat and humidity can be sneaky. We do not suggest you sit down and eat while on our two-hour tours as this is likely to take up all your bike time. You can bring finger foods and snacks and we encourage you to do so. If you want to add some yummy food to your tour, check out our Progressive Dinner Tours. What if I have more than 16 people? Rent two bikes – contact us for more info. An automatic 20% gratuity is added to reservations of both bikes. No more than 16 people can be on one bike per insurance and City of Memphis rules. Do you have to pedal? Ummm, duh!!! Yes! Although we do have a motor assist, pedaling is necessary. As with all party bikes, the motor is strictly an assist that is helpful on inclines and long stretches. Come on, it’s a BIKE you big goof. Don’t be a weenie, you can do it!! All tours are 2 hours long with the exception of our Progressive Dinner Tour, which is 2.5 – 3 hours long. Tours will be booked by reservation online. Depending on your day, tours will range from $250 – $400 for two hours of a heck of a good time. Check current pricing here . Don’t forget about your driver. Tipping of at least 15 – 20% is encouraged and appreciated. We ride rain or shine. We will contact you of a cancellation due to weather, so please don’t assume your tour is cancelled. You will not receive a refund if you don’t show. Weather cancellations can occur up to the time of the tour. Safety is our #1 priority, we will not allow a tour to ride in lightning or severe weather. If your tour is cancelled within the first hour, you will be provided a rain check. Our drivers work on tips so it is always appreciated! 20% is customary for private groups. Automatic gratuity of 20% will be added for use of multiple bikes and corporate functions. We reserve the right to charge your credit card following the tour if necessary. Since Sprock n’ Roll bikes are powered by its passengers, they control the speed at which the tour progresses. For scheduling purposes, however, it is necessary that the tour end within 15 minutes of the scheduled return time. Yes! Bring it! All decorations must be socially appropriate. We will not cover our signage. How fast is this thing? The bike averages out at about 5 mph on flat ground. ABSOLUTELY!! Please do! Our guides are happy to take pictures with whatever device you have. Can we bring a keg? You may bring a pony keg. This is a great option as we provide tap service and cups. All you need is the beer! Boscos offers a $55 pony keg to our customers with 3+ days notice. Give them a call at 901-432-2222 and let them know you are riding with us. Tin Roof offers a $60 pony keg of Mich Ultra or Budweiser and an $80 keg of Ghost River. Text Jock at 901-233-2875 with your reservation date and time to reserve your keg. 4+ days advanced notice is required. Can we wear costumes or dress up? Of course!! We love a themed party! Just be aware of the length of your garments and costumes. You don’t want them getting caught in the pedals. Do we have to go in the bar at the stops? Absolutely not! You may chill on the bike with your cold beverage. Bar stops are an opportunity for you to take advantage of our exclusive specials and to give you a break. You may find a bar you are DYING to come back to. You will also appreciate the stops as pedaling for two solid hours would get old REAL quick. I'm pregnant, can I ride? This is entirely up to you and your doctor. If you do choose to ride, sit on the bench in the back rather than a pedaling seat to ensure your safety. It is no more hazardous than riding a regular bicycle. However, as with anything, there is always a risk involved so ride at your own risk. No biggie! There are only 10 seats with pedals. The remaining 6 can just relax. Can we squeeze on more people over the 16-person limit? No. Sorry. It’s against insurance and the City of Memphis rules. We don't have at least 6 people to meet the minimum. Check out our “ Mix N’ Mingle Tours ” offered on Thursdays, Fridays, Saturdays and Sundays.